The following was presented at a special exhibit. Haeger was also the subject of a presentation to the club in October of 1996. Complete exhibit gallery coming soon. The Haeger Potteries, Inc. added its Art Pottery line in 1914. The company had already been a successful producer of brick and tile in Dundee, Illinois for over 40 years before that date. Art Pottery was extremely popular in the United States during the early 20th century, and dozens of commercial potteries were stated to meet the public’s demand for decorative vases, figurines, and accessories. Nearly all of these firms have since vanished, but Haeger continues to this day to produces ceramic artware, making it one of America’s oldest and most successful artware manufacturers. Perhaps the person most responsible for Haeger’s shift from brick and tile to artware was J. Martin Stangl. In 1914 Stangl joined Haeger to create its new Art Pottery line. He came from the successful Fulper Pottery in New Jersey, a firm well-known for its beautiful flowing glazes and its strong, simple shapes. Stangl’s early designs at Haeger also emphasized glazed and form over decorative embellishments (such as underglaze hand decoration). Stangl’s designs for the firm drew on classical and Arts and Crafts shapes for the early ware. The glazes used – particularly those in the early teens – strongly resemble those used by Fulper, and were in some cases identical. Stangl often used a mottled green glaze at Haeger that was later imitated by other potteries, and that is commonly found on many unmarred vases made during the first half of this century. Haeger continued using Stangl’s more popular shapes and glazes after he left to rejoin the Fulper pottery in about 1919. During the Depression, Stangl purchased the Fulper company, which he later renamed Stangl Pottery. The Stangl Pottery produced an outstanding line of bird figurines in addition to its many popular dinnerware lines. Collectors prize Fulper and Stangl pottery today, but J. Martin Stangl’s early Haeger pots remain largely unappreciated and undervalued. Additionally, much of the pre 1938 ware was unmarked or had paper labels, and is often confused with that of Rumrill or Camark, potteries that produced some colors and forms similar to Haeger’s. Royal Hickman, Haeger’s second extraordinary artist, was born in Oregon in 1893. He worked in construction until suffering sunstroke in Panama, and began to sculpt during his recovery. Hickman’s first commission was a dinnerware design for the Garden City Pottery of California. During the 1930’s, he worked in Europe creating crystal figurines for export back to the United States. The approach of World War II brought him home; he joined Haeger as chief designer in 1938. When Royal Hickman’s modernistic sculptural forms met Haeger’s complex glazes, the results were an immediate sensation. Art Pottery historian Marion Nelson has described Hickman’s work for Haeger as an opulent blend of “undulating movements combined with Art Deco stylization.” The public loved the new Royal Haeger pottery and accessories, and the firm’s expansion in 1939 to include a second factory and a lamp division was partly due to the line’s success. Royal Haeger remains a favorite with collectors and pottery lovers today. Royal Hickman left Haeger in 1944, but contributed additional designs to the firm during the 1950s on a freelance basis. in the interim, he operated studio art potteries, first in Tennessee, then in Florida. Hickman also designed crystal animal figurines for the Heisey Glass Company, for which he is justly famous among glass collectors. Eric Olsen led Haeger’s design department from 1947 until 1972. He was responsible for most of the company’s forms during this period, including the famous blood-red Haeger bull, although many great American sculptors and designers also contributed to the firm’s product line. These names include Franz Joseph Koenig, Glenn Richardson, Sascha Brastoff and Sebastiano Maglio. During the 1940s and 1950s, Haeger created an extraordinary series of table and TV lamps. Cowboys on bucking broncos, sleek panthers, angelfish, and prospectors with their burros were only a few of the popular figural designs. Haeger lamps from this period are much sought after by today’s collectors, and their secondary market value continues to increase, despite the fact that they were relatively inexpensive when retailed. Haeger used a great variety of colors and textiles in their glazes, a fact that has undoubtedly contributed to the company’s success. 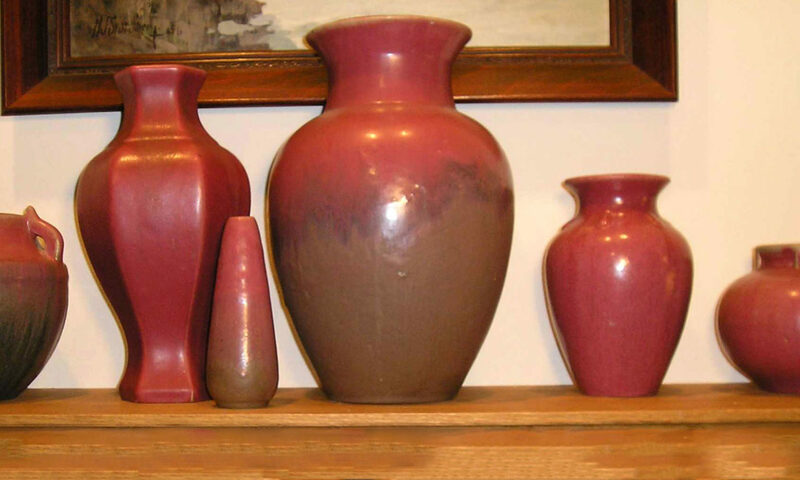 Today, even Haeger pottery from the 1960s and 1970s is growing in popularity among new collectors as they rediscover and remember its beautiful shapes and rich colorful glazes. The Haeger Potteries, Inc., remains a highly successful family owned and operated business after 127 years of operation, and 84 years of Art Pottery production. The firm’s enduring success is due in part to the path set by J. Martin Stangl in 1914. As Marion Nelson notes, Haeger “shapes and glazes take priority over decoration.” To this day, Haeger continues to produce distinguished Art Pottery at a reasonable price. Haeger Potteries has an outlet store (and small museum) and offers tours of its facilities. The tours are offered free to the public twice on Mondays at 10am and 12:30pm. It is a 30 minute walking tour that is not handicapped accessible. Children over the age of four are welcome on the tour. Groups of 10 or more will need to call in advance for reservations. Ask for the Tour Director. The outlet store and museum is handicapped accessible and is open Monday, Thursday and Friday from 10am-6pm, and Saturday and Sunday from 11am-5pm. The store is closed Tuesday and Wednesday. Contact: The Haeger Potteries, 7 Maiden Lane, Dundee IL 60118, 847.426.3441. The Haeger Pottery Collectors of America publishes a bimonthly newsletter about the pottery and its products.